In two weeks, 1,000 of the best and brightest in dentistry will be meeting at the 13th Annual Dental Management Conference in Scottsdale, AZ. 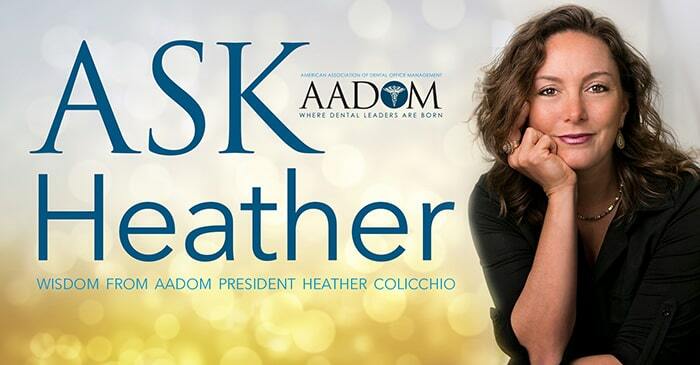 This event is produced by my team and company – the American Association of Dental Office Management. There is an unbelievable amount of planning and logistics that goes into this event. This Saturday, I received a call from our Executive Director, Kim McQueen, alerting me to just how badly Texas will potentially be affected by Hurricane Harvey and how we need to plan for those affected who will not be able to make it to the conference, possibly up to 50 attendees. How can we make it right for them? She then suggested I speak, not from a logistical standpoint (we’ll take care of that), but from my heart to those affected, as I was in the direct path of Superstorm Sandy not that long ago. So, here goes. My hope is that these words deliver hope to those who need it now. The night before Superstorm Sandy hit, I evacuated my family from my home in the town of Rumson, NJ. I live on the Shrewsbury River, only two miles from the Atlantic Ocean. We traveled 30 miles inland to my mother’s house. Without power there, we could not watch any news and were spared the shocking imagery of the storm – this magnificent beast of Mother Nature. I returned home the next day with my husband, expecting to find some minimal damage. We returned to what looked like Benghazi. The devastation was surreal. Our idyllic town looked like a war zone, and being right on the water, our home had suffered badly. Most of our possessions were ruined, if they were not picked up and swirled out to sea. It would be several months before we could safely return home for good. Your priorities will shift – in the best possible way. What seemed so important, suddenly was not. What was important was that my family was alive. That simple. My dog was alive – we evacuated her with us. Again, that simple. You have more stuff than you need. We lost so much “stuff” in Sandy. Stuff is not what makes life great. Your friends, your family, your work, your passion, is what makes life great. The insurance worker flown up from Oklahoma who, before diving into “insurance business” as we stood in the wreckage, simply gave me a hug. Thank you. All who donated. In my life of privilege, I never thought I would find myself on the receiving end of charity. But there I was, at a makeshift Help Center a few weeks after the storm. My children had to go back to school. Their backpacks were ruined and stores were closed so I could not buy them new ones. At the Help Center, donations of all sorts were there for the taking: food, diapers, clothes. I told one of the volunteers I needed 2 backpacks. She told me all of the backpacks had already been taken. She must have seen my crestfallen face and, mother-to-mother, she said to me, “Wait here. My children are older. I think I have some at home”. She returned 15 minutes later with 2 used backpacks for my children. Eternally grateful. My AADOM Team. They picked up for me in every way. They showed their true colors and proved to me I have a team that has my back. You will find the same with so many in your work, and in your community. This is a blessing. You don’t always have an opportunity to find out how deeply people care about you. Your amazing and this was so inspirational to those who are facing horrific times. Thank you for these heartfelt words. Wow! What an amazing story to share. I sure hope it provides comfort to those in Texas in the days and weeks to come. Thank you for sharing your amazing story. I hope your words will be of help to so many in this time of need. My heart and prayers go out to each of them. I have not lived through a devastating storm like this, but I have lived through my youngest sons horrific car accident a few years ago that left him a Traumatic Brain Injury . When I asked someone about life being normal again, he simply replied “you need to redefine normal”. For everyone affected by this disaster, I pray God will give you strength and the ability to continue to move forward in the days to come. Thank you Heather for allowing us to post here so that maybe our words from our AADOM family will be of encouragement and comfort . What an amazing story and so well written! Continues prayers for southern Texas. Thank you for sharing; your story will provide so much light for those who need it. Well Said. My thoughts are with those in Texas. I cannot imagine. The only hope I could put out there is that It is in these storms, that we find our true self strength, and resilience. Indeed this storm will pass. I am sorry that it is happening at all. My heart is with those in Texas. Thank you for sharing your story. Really! Your words will comfort so many. Prayers for Texas! I hope the victims in Texas are able to read your inspiration story. It helps to put perspective on what is really important and that this too shall pass. Thank you for taking the time to share your story with all of us. Thank you AADOM for your thoughts, prayers, well wishes, and support. Our office is located in Humble, Texas. Our team lives in the Humble, Kingwood, Atascocita, Spring, Huffman, New Waverly, and Dayton area. (Harris and Liberty County). We are blessed to say “we personally” were safe from the storm. However, the destruction all around us is beyond words. It is so comforting to see everyone come together and be Present. By this I mean, people are not just working to help get others to safety, providing shelter, food and clothing. They are present- listening, comforting, compassionate and giving full attention to those in need & right in front of them! Wow! Sometimes in life it takes a tragedy to make us sit up straight and really think about things. This is one of those times. I have taken on a new prospective in life. Thank you again for such strong words of encouragement! AADOM, we are blessed to say, “Harvey” did not keep these Texans away from Phoenix, AZ. We look forward to being surrounded by some of the most talented people in the dental industry. See you tomorrow. So the question is, What can we do for the 50 or so AADOM members that were affected? We run dental offices. We can do anything. I will help organize in any way you see fit. Let’s brainstorm. Thank you for sharing your story. May we become the angels for those who need us. Well spoken! As one who lost all possessions and my home from a tornado, it is hard to describe the reality that comes to us in a moment of crisis. It is with faith, hope, and love that we persevere. And within the words of faith, hope, and love, we have an action of support. All those affected, please stay strong and let your friends in dentistry know how we can be of help and encouragement.